…husband stuck at work late tonight…so I was on my own. nothing happened. other than I gave myself a shot. the red welt appeared…man, it still stings. but, I survived. again. that’s the latest. pretty anti-climactic, wouldn’t you agree? sometimes anti-climactic can be good. found out yesterday that if a neurologist identifies twisted blood vessels in your neck and you have MS – an angioplasty might be the solution: they have been found to alleviate MS symptoms. and Parkinson’s symptoms. Canada is working on a study. go figure, the FDA is not very supportive of liberation therapy. misc: I ran into a neighbor tonight while out walking the dog. she saw us walk by her window the other day at 5AM. we were being followed by a coyote. nothing happened. anti-climactic, again. yeah! off to our fave irish pub tonight. so grateful for your support. one of my girlfriends asked what she could do for me. my reply, enjoy every day…and play as much as possible. I had an idea for a new post float into my thoughts while sitting on my couch this morning, dog on my lap. enjoying my coffee. meditating as I watched the sunlight dance across my favorite beach scene. but it left me. as quickly as it appeared! oh! it just showed up again! that didn’t take long. good thing I sat down at my laptop and started typing. yesterday at work I thanked my staff of 22 for showing up at work every day. how much do I sincerely appreciate that! side bar>>>selfishly, it sure makes my job easier! I wasn’t talking about showing up in the sense that they are physically there. but having the passion to show up mentally and with a desire every day to make a difference. in order to do their best work every day. not everyone is happy at work and that’s okay. I get it. I endured a rough two years of not being happy at work. I provided evidence over and over again to justify my original thought – I’m not happy at work. so I never was. huh. amazing how that happens. that all started to change in 2011 as I was determined to improve my happy factor at work. then…this summer after MS showed up, uninvited, I had no choice but to improve things. so I did. I stopped complaining about work, and the work stress just started to fade away. and now, it literally doesn’t seem important anymore to worry about what I cannot control at work. huge shift in perspective. as a result work has become easier. I show up, and give what I can. and just allow the rest roll off my back. where it used to like to hang out 24/7. but it’s not just at work. it’s with everything. I love writing. so I’m writing again. do I have the energy to write every day? no. is everything I write brilliant? not even close! and that’s okay. I still show up and subject you peeps repeatedly to the inner-workings of my mind. I signed up for another creativity class next year, The Artist’s Way. I also have stopped beating myself up for not going back to yoga yet. I’ll get there. for not keeping a spotless house. for not having enough practice hours to pursue life coaching certification. and for not traveling enough. it’s all okay. I still want to do those things, so I will. sidebar>>>the travel showed up on its own! we are off to maui next month! beautiful things can happen when you let go of your story, fears, and accept what is. there is too much dang beauty and inspiration in this world to be sidetracked by the yuck-o thoughts of not being good enough or doing enough! side-tracking: that’s just too easy! I like to take the more difficult path – I don’t side-track anymore. I show-up as much as possible. which will, in fact…be the easier path. in the long run. it just requires a daily effort. but it’s so worth it! final sidebar>>>unfortunately, we all come from generations of strife and conflict. it’s how we are programmed. it’s in our DNA to look for the negative. b’ah….I don’t want that! everyone has the opportunity to change that, by showing up in life a little differently and a little more every day. where it matters. what do you do to show up for your life? not sure what to blog about tonight. how about what I accomplished this weekend? hmmm…not much. not very interesting actually: laundry. dishes. most of our Xmas cards are now prepped and ready for mailing. ran out of cards. stressed while figuring out how to use labels that were not the right size for the address label template. ha! (I can’t write clearly anymore. I never did. worse now.) figured out a workaround. the MS hug got me halfway through. it’s not a loving hug. unfortunately. but yesterday, I saw my family. my extended family. and closer. lots of loving, lots of hugs. innocent kiddos. it was good. it was a last-minute decision to see my family: my uncle old guy (UOG) was not hurt on Friday. he works for SCE. and was in the building when the shots were fired. he knew the peeps who were killed. the entire company is shell-shocked. you never know, do you? never take anything for granted…never. but, yesterday there was life all around us. from babies to my 88-year-old grandma. too much? maybe. maybe not. am I being too open with my feelings on my blog? yes? I think I so? maybe? I thought about this long and hard. and then thought about it again. oh, and then there’s the minor detail that I find myself pressing PUBLISH over and over again. something is pushing me to keep writing. final conclusion: it’s definitely a no. this peep only wanted positive musings. right out of the gate. I get that! I want(ed) that too. everyone does, right?! but, for me writing is how I reach that feel good. when I need it. why would I give that up just because it’s too hard for someone to read what I have to say? I’m cool with the fact that some peeps don’t always get my posts. seriously. I am. I have a quirky sense of humor. I can be too serious. often confusing. I genuinely like to make fun of myself. and I make unusual and random connections. I have to do this. especially when we’re talking about MS. turns out writing is a new basic requirement for me. MS has been a blessing for me. I think I have said that before. but it has helped me learn to be closer to the authentic me. and appreciate the real me. self-indulgence via the blogosphere. perhaps. but I want to assure anyone going through something similar…that it can get better if you allow it. slowly. turtle steps. it can take time. and that’s okay. sidebar off topic>>>for you young peeps, pay attention to this! trust me on this one. and for my family of girls, you are all fascinating, smart, funny, riveting. and worthy. perfect. just the way you are. and there is only one you. I had a work peep tell me last week what an inspiration I have been. I didn’t know what to say. I almost dropped my soup mug. whaaaat?? I don’t get it. was my immediate internal reaction. yup. that night I cried in my therapist’s chair when I shared that story. good grief, Charlie Brown! personal feelings when faced with a chronic condition too heavy for a blog? I think definitely not. what do you think? I’m picking the doing part of this equation. huh. that felt so good. I have found something that really works for me: I write to my present self. this happened Wednesday night after a rough few days. I have written letters to myself before. it is one of my ongoing therapy assignments. not writing to the present me was the direction – but writing letters to the past me. which works. very well. that, and feeling the left-over emotions. seriously. read up on the mind-body connection, and you’ll see. it’s important to really feel, what you’re feeling. let it in. and out. answer immediately comes to me, and I bounce off the bed. shushing, the other voice that is telling me to wallow. I wipe away the tears of the past three days, and head to the living room and my laptop. by the time Tim returns home with a rotisserie chicken, I have pounded out a letter to the present me. I just re-read my letter. I talk to myself like a friend: observational, empathetic, and non-judgemental. I repeat, like a friend. it feels good. that’s the adult me talking. yeah! note to self: repeat, and repeat often. I don’t normally talk to myself like I do my friends. huh. working on being a better friend to myself. and keep working on it. it’s already there. it should be easy. what do you do? I would love to hear. today I realized that things have officially started to shift. I’m still experiencing same and a few new symptoms. gotta love the bee-sting shocks. random and constant pain is my new normal. and I’m walking more slowly than ever. I feel better emotionally than I have in a long time. if ever. it comes from a variety of reasons. I have the most awesome therapist. I have accepted my MS diagnosis. it is a blessing. it has readjusted my thinking. things that used to be a catastrophe are starting to roll off me. more easily. as opposed to the hunger they used to have. desperate to hang on. being nice to myself for the first time…in forever. and, finally. I have stopped smoking. again. for good, I add. nine days now. “yes, I thought I should provide full disclosure.” I reply. very sheepishly. “should I not have put that on a medical record?” I ask, admonishing myself already for being so honest. I don’t have to be that honest. come on! but I do. I just spent eight months learning about being transparent. authentic. and open. I thought I was being all three in stating what is. I have smoked on and off since I was 22. full-time for a good five years. and more than 1/20th of a pack a day. my friend calls me a closet smoker. I guess I am. everyone is always surprised when they find out I smoke. (note>>>now I can say I used to smoke.) and I loved to smoke. oh, did I! even when I didn’t. I always knew I was going to smoke. I used to love the smell of cigarette smoke. I remember being in a parking lot in FL with my parents walking behind an unknown peep who was smoking as we were on our way somewhere…and I couldn’t stop inhaling the remnants of smoke I had picked up on my skin from this random smoker. I was seven. yes, I’m a strange one. I quit for my first official time in 2003. followed by two years full-time off the nico-demon. but relapsed a few times since then. in times of stress. when we bought our condo. that time was only six weeks. quitting was easy. peasy. and then I returned to the nicotine on and off quite a bit in 2010-2011. plus a very brief dabble in 2009. after a boatload of stress. work. and other things I could not control. but I was able to stop smoking without missing it. dropped it. just like that. this time it wasn’t so easy. I’m using nicotine gum this time. for the second time. I used to crave it after I quit in 2003. didn’t need it all the other times I quit. I feel good not smoking anymore. my lungs sure appreciate not smoking. do I miss it? heck yes. but as numerous people have told me: I have to quit. MS lesions do not like me smoking. I get it. I finally get it. learned recently while listening to a Stuff You Should Know (love Josh and Chuckers!) podcast on nicotine that some people’s brains are pre-disposed (among other things) to loving nicotine. smoking triggers a huge reward system in the brain. feel good neurotransmitters. huh. I must be one of those peeps. blast!! fighting that too. but, this is an easy one. quitting should be easy. I can control it. this is one thing I can control. picking life. taking care of what I can. and breathing. if nothing ever happens to me, then nothing will ever happen to me. “she kept telling me to relax!” I say to my massage therapist recounting a massage I had at a local day spa a couple of weeks ago…while at the same time leaning into her hands, kneading my tangled shoulders. “uh huh. I’m still working on that. clearly.” returning my attention to the table. to the present. willing my crabby shoulders to let go. they have been cinched tight since 2006, when I could no longer ignore the fact that I needed to see a chiropractor. relax. unravel. not feel responsible for everything. it was back then when I started to realize that I was definitely on the wrong trajectory for happiness; my high anxiety MO was showing up in my back. it still likes to make an appearance sometimes, unfortunately. why is the eternal question! because I let it. easy answer. hard to overcome. fast forward five years. I’m doing better. I think. this year has been a doozy for my fears and stressors. and not just with MS showing up for me. for everyone. bad things can and do happen to good people. and for no apparent reason. that is life. and it is what it is. huh. yesterday, I ate dirt. literally. I thought I was in control, but I wasn’t. and gravity took over. and I released myself to what is. I fell off my bike. for the first time in 24 years. yeah, I’ll say it: I’m not much of a risk-taker. period. shocker, I know. I have been so caught up in being in total control, that I always make sure that I won’t fall. ever. by riding slowly. and only on roads that I know. braking carefully. and at the right time. sidebar>>I biked 32.5 miles in 2010. for MS.
now I get why my husband was so eager to get me on a mountain bike. ha! riding off-road is a different matter. completely. I hated it when we first climbed off-road and rolled down a gentle bunny slope. there was little I could do to control what my bike did. or so it felt. I was in full-fledged terror of flying over the handle-bars. but I still got on the bike. again. and again. I knew there was a greater lesson I had to learn. so I took it easy. learning what terrain is treacherous. how my tires like to spin in the sand. how to work my gears. how to brake gently if I picked up too much speed going downhill. or jumping off when it gets too scary. how to relax my arms, and feel the trail. and mark my line ten yards ahead. I manage to jump off my bike narrowly missing a plunge in the pool of slimy goop. My husband turns around and shouts, “what, you guys followed me! ?” incredulous. I opt to back up my bike and return to flat ground. phew! our other riding buddy continues forward. once both guys have circled around, we make our way back to the wider trail only to find ourselves riding through water and a thick mud. so far so good. after a slow mud splattered quarter of a mile I hear my hub, up ahead 50 feet, say “uh oh,” as the front end of our mini-peloton tries to pedal through four inches of swollen mud. I pause as I watch my husband and our buddy in front of me veer to the right…and follow suit. but then my tires lose all traction and start to slide. I stand up on my pedals to push them harder, but it’s too late. I am going over. and over I go – right into a thick bed of mud bathed in slimy water. I land hard on my right side. with my bike on top. like a newbie, I don’t follow the rules in situations like this and hang on to my handle-bars. the guys, used to my normal squeals know this one is legitimate. they both toss their bikes aside and bound over. to find me lying in the muddy water. perfect. “are you okay?” my husband asks after pulling my bike off me. he extends his hand to pull me out of the muck. I laugh. I can’t help it. “yep. it’s all good. I can’t believe I just fell off my bike!” I say in awe, as I feel the water and mud seeping through my clothes. I survey the damage: gloves, sweatshirt, bike shorts, leggings…everything is covered in sloppy mud. I faintly recollect 3rd grade, when I slipped into a puddle of muddy water. and had to return to class. dripping in mud. in front of everyone. one of my fondest memories. a mild burning sensation starts to surface on my right thigh. I taste mud in my mouth. and spit a couple of times. shooing away the thought of an impending bacterial infection. I hop away feeling the pain start in my right knee, as gracefully as possible…only to hop into three inches of mud again. both feet. nature just won. I pull up my right shorts leg, to find a bloody scrape. on the opposite knee that I scraped 24 years ago in my last bike crash. go figure. knee and bum are still sore. but I will get back on my bike again. and with less fear than before. because I have finally fallen off my mountain bike and didn’t die. check that off my list. yeah! “oh, no, are you ok? ?” I ask, immediately feeling quite sheepish for my amazement of surviving yesterday’s fall. shite happens. it’s how you react to it that makes all the difference. side bar>>>my iPhone also survived a plunk in the muddy water! today, I saw a coyote. a coyote that crosses in front of you is a sign. watch out for tricking yourself into believing, when it should be the opposite. rely on your intuition. but be careful. don’t mistake fear for intuition. the coyote is my totem animal. and today, I received a sign. how cool is that?! instead of being wary and always alert…and NOT acting when all intuitive signs are pointed to GO or STOP (my usual MO)…I’m going to take this as a good sign. only I can do that. no one can do it for me. had lunch with a friend the other day. also a writer. we discussed my idea to post my pages on my soon-to-be-developed website. and request feedback while I’m drafting. it would be fluid. and credit would be given. where credit is due. but then there are legal issues to consider. and feelings that could get hurt. maybe. still mulling the concept. something will take flight soon. I feel it. I already have 28K words on paper. and 50 different themes. and one new short story idea that just surfaced. 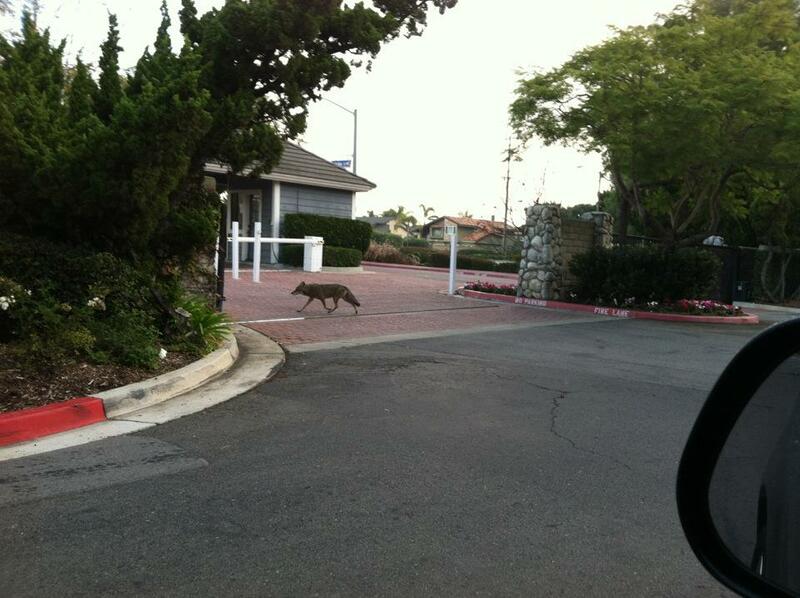 I watched this beautiful, sleek coyote make her way to a busy street. she looked left, and then right. and when it was safe, she sprinted. I whispered to her. to me. signed up for life coaching with Martha Beck. met some super cool peeps. worked hard both at work and with coaching. had some good, life changing family visits. yeah! saw lots of doctors. had lots of tests. been wowed over and over again. get used to my new normal. make a plan for 2012. 2011 so far has been the year of lots…I’m ready to slow it down. so…what has 2011 looked like for you? I would love to hear! I know quite a few of my friends have made drastic changes in their lives…while I have watched from the sidelines…en-couraged by their courage. “looking good, Louis…” my husband says from inside the condo. “feeling good, Billy Ray…” I reply from the balcony while working on a tree pose. I look through my legs in down dog, and stick my tongue out at him. it then hits me…I really am feeling better. the best I have felt since before July 29th when my legs crapped out on me. when all I had to worry about was work and not having enough time to spend with my friends. …maybe it’s the break from work. …maybe it’s the stress-free life on Marco Island…where outside of my sisters, we are the second youngest couple on the island. or maybe it’s just the fact that I’m taking a break. period. a break to do nothing. sometimes it’s hard to do nothing. don’t you agree? my therapist asked me on Sunday what I’m going to do while in Florida if I start to feel a wiggle of stress starting to squirm. yes, I murmur to myself. insta-follow up thought: silly approval seeker. note to self: work on that. seriously, can this woman read my mind? “that sounds good to me!” I say…though eager to fast forward six months and experience treating myself with utter kindness and mercy. then I stop my thoughts as I see them starting to grow, and remind myself that all I can focus on is right now. I can do this. turtle steps are just fine.